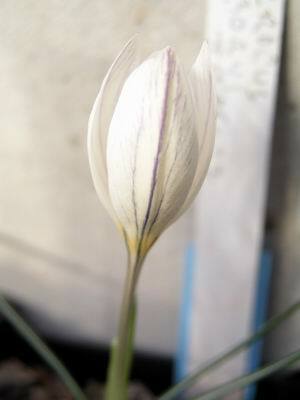 A late form of Crocus boryi, with some nice purple feathering, keeps the crocus season going through December, unfortunately it has been pretty cold and the flower has not managed to open up. I have to be vigilant and remove the spent flowers from the crocus as they can very quickly become infected with mould in the cold damp conditions. The secret is to leave them on the plant long enough for the pollen to grow down the tube and fertilise the seeds before you pluck them off. Once they collapse like the one above it is safe to remove them. 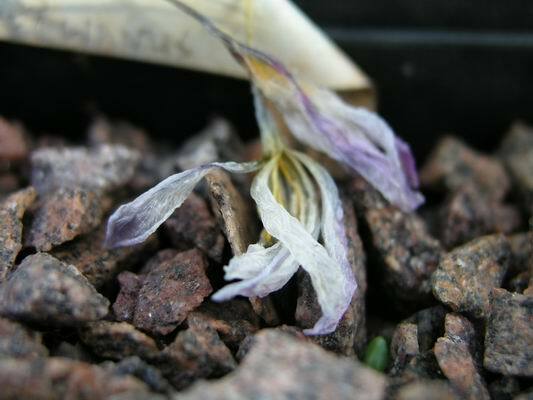 I was very pleased to receive, from a friend, some wild collected seed of Erythronium rostratum. This is one of the group that I call the 'eastern yellows' and includes E. americanum - I am deeply confused by the naming of these. 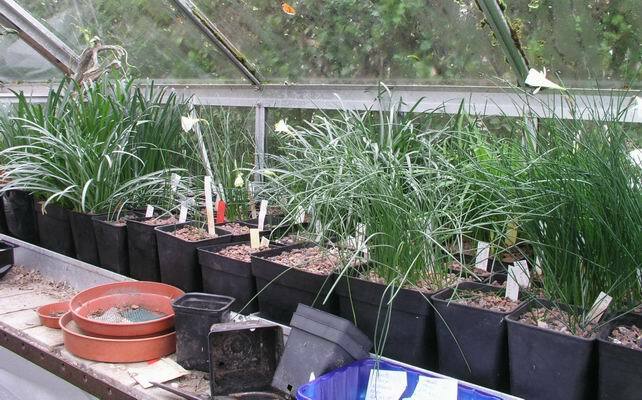 I have only studied them in cultivation, where I suspect we may have hybridisation, so the more wild sourced material that I can get will help me understand the small differences between the species. The reason for the picture is to show the advantage of soaking the seed overnight in water, to which I add a smear of soap to break the surface tension. The tiniest amount of soap is required and I just rub my finger on the top of the washing up liquid spout and then dip my finger into the water - that is all it takes. 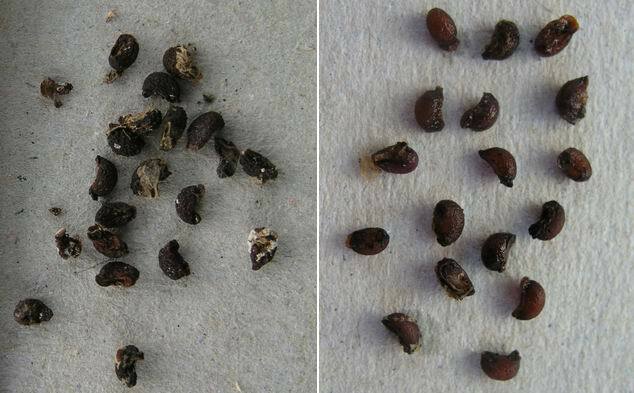 You can clearly see how they have plumped up, with the dry seed on the left and the same seed after soaking overnight on the right. While on the subject of water, I am continually checking our bulbs to see if they require watering. When I water at this time of year I always choose a relatively mild dry day and preferably when there is no forecast of hard frosts. How do I know if they need water? It is a combination of checking to see if the gravel top dressing looks dry, how moist is the sand plunge and do the leaves look at all dehydrated and floppy. Because our weather has been cold it has been four weeks since I last did any watering and today I only had to water about ten pots; if the weather had been mild and sunny I would have had to do much more watering. 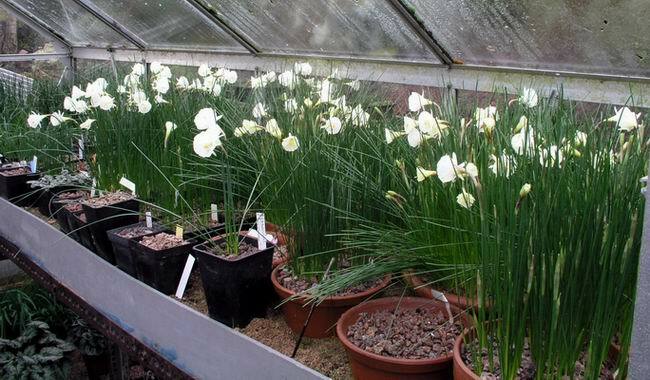 You can see from the water on the glass roof how cool and damp the conditions are, and the sand in the plunge is still very moist so even though these Narcissus romieuxii mesatlanticus are in full flower they still have all the moisture they need. 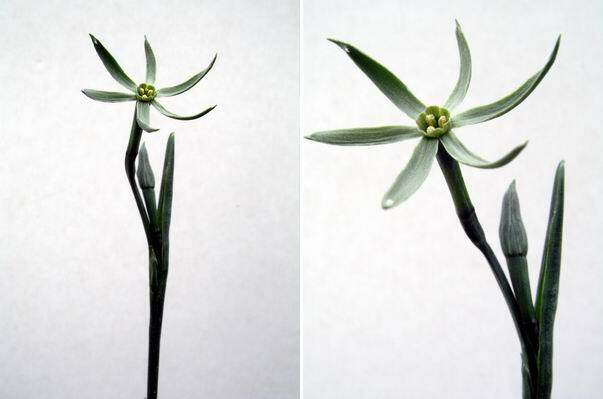 Another sign that indicates they may require water is if the flower stems start to flop over but this can also be as a result of them etiolating in the low light levels, so weigh up all the factors. 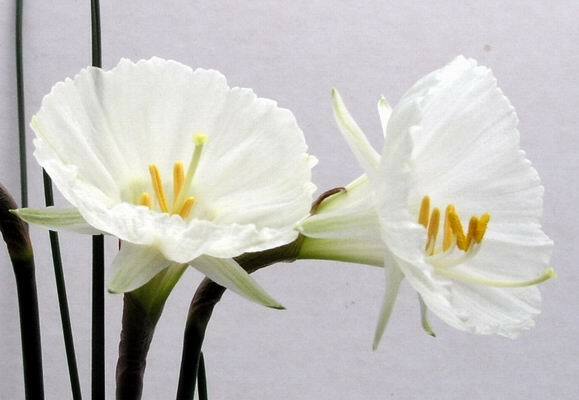 I have several pots of narcissus that I have grown up from bulbils given to me over the years that are now flowering well, like this pot of Narcissus albidus albidus SF110. What I now have to do is to carefully read up the books and look closely at the plants to try and confirm that the names are correct. This is not a chore but a lot of fun and it is the best way to learn about the plants that you are growing - it forces you into looking at them in detail. Here is another comparison to show how using the back board completely changes the picture, isolating the plant form its surroundings, both pictures serve a different purpose. 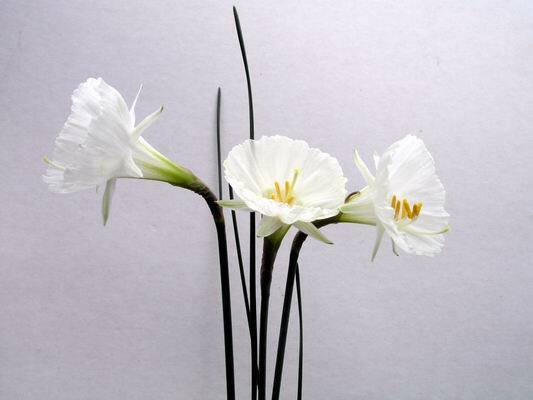 The back board is particularly useful when photographing flowers like Narcissus viridiflorus which would disappear into a confused background. Our flowers are only just opening some 4 weeks after Anthony Darby showed us his in the 'flowering now' threads of the web site forum. 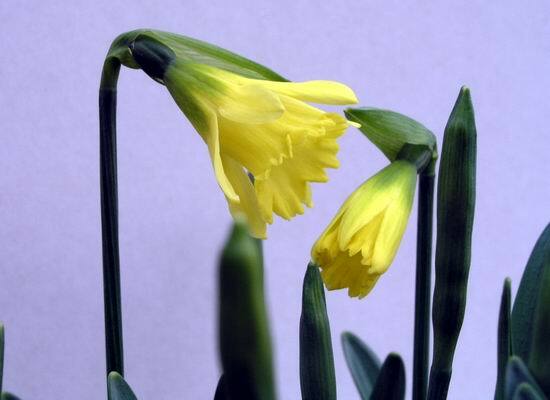 It is a strange Narcissus in that when it flowers it does not produce a leaf, the flower stem doubles up as a leaf, so if you have bulbs with leaves on they will almost certainly not flower. It also has the most amazing scent that smells like a warm wet horse! 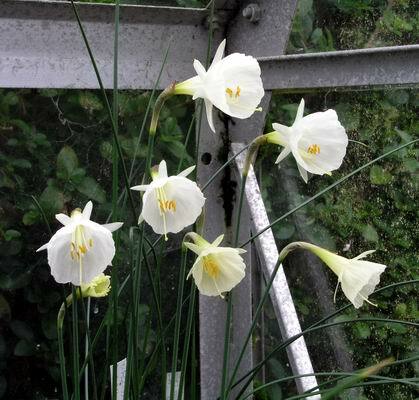 The first flowers are also starting to open on Narcissus 'Cedric Morris'; the pots should be in full flower by the end of December. 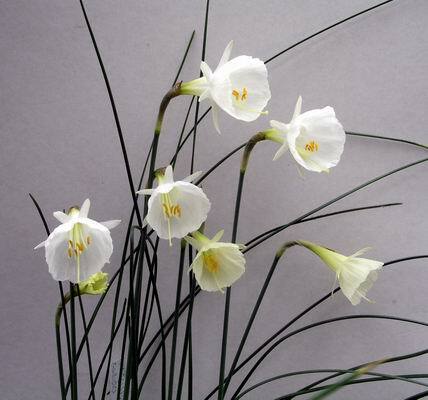 This is a delightful dwarf member of the trumpet daffodils; it is for all accounts like a giant form of N. asturiensis. Above is a portrait of one of our Plunge Seedlings that we have selected as being worth bulking up. It is very close to Henry Taylor's cross N. 'Camoro' and it may well be a seedling from this fertile hybrid between N. cantabricus monophylus and N. romieuxii - it differs in flowering slightly earlier and the flower shape is slightly different in that it has a wider flare and throat which can be seen in the next picture. Finally as this is log 50 in the second year of what was to be a one year project I want to know if you want the bulb log to continue? Or are you all fed up of me droning on every week? If you would like me to continue for another year then please let us know in one of the following ways. It is a brand new guest book as Mr Admin had to shut down the old one due to spammers and pop ups, the new guest book can bar this type of post. The old one has been left on as an archive. 2) Make a post to the bulb log feedback in the forum pages. Please let us have your opinion.